Symptoms include the shaving of body hair, the adornment of earings and necklaces, an obsession with the body beautiful requiring many hours in one of the many new private gymnasiums that have sprouted and taken root. Hairstyles are now a thing of art. The Yonqui (named after El Yonqui, an incredibly popular reggaeton artist best known for his outrageous outfits and hair), has morphed into a whole sub-set of styles and variations. More recently “The Shark” (shaved sides, wide crest of hair combed towards the back and gelled into a fine point) and the Pineapple (shaved sides with long hair weaved into several braids that tie up to go in different directions) have taken off. The essential uniform of choice is drainpipe jeans or wide-leg shorts above the knees. Often they are slug really low on the hips. T-shirts should be tight, colorful and branded. 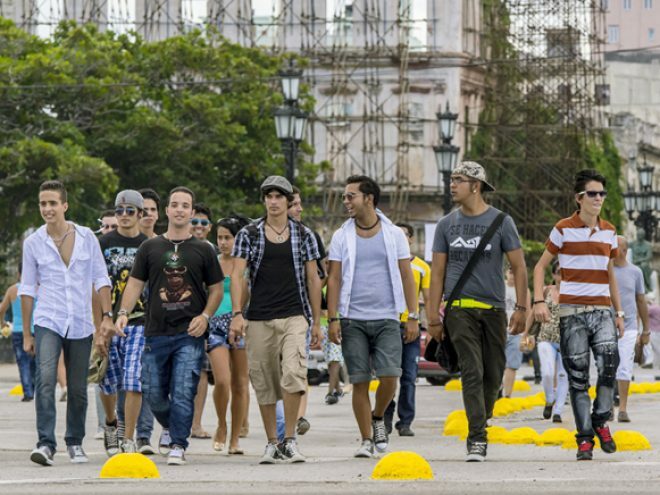 And forget the instantaneous and infectious Cuban smile (although scratch a little and it will break through)—if you want to walk the streets of Havana with your buddies you need to affect a serious nonchalant scowl. Let’s be clear, I seriously doubt that even now Los Habaneros hold a torch to their female brethren. This is a population where even the cleaning lady gets dressed up to go to work, where every girl thinks she would win America’s Top Model contest and where no trip, however short, should be undertaken without some serious preparation. False nails, hair extensions, manicures, pedicures—these are part of a staple diet to prepare the body beautiful. Just visit one of the many spinning or pilates classes, or take a walk down 5ta Avenida to see how much work goes into making La Habanera such a thing of beauty. This season has seen hair become straighter, jeans tighter, colors brighter. This is no Paris Spring season but as they say here, se nota la diferencia. And as for the guys—viva El Habanero metrosexual! June 2014 This article formed part of the June 2014 issue of What’s On Havana The definitive monthly travel & culture guide to Havana Download our current issue of What’s On Havana, your definitive travel, culture and entertainment guide for all things happening in Havana, Cuba’s bustling and enigmatic capital city. We include features from around Cuba written by the best international travel writers covering Cuba. Our monthly online digital magazine is also available in Spanish and French.